One of the biggest trends in jewelry right now? Link necklaces. 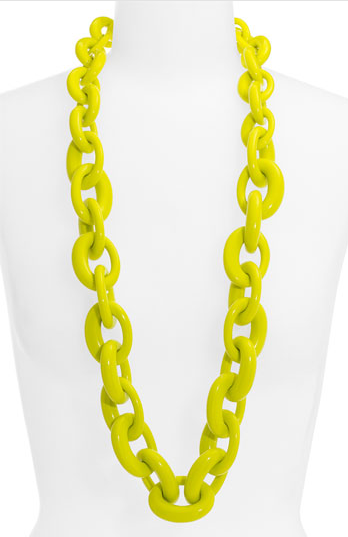 Bold hues, oversized links, resin or even twine ... to wear this style, think the bolder the better! (See, for example, the Tory Burch Oval Link Necklace above, $195 at nordstrom.com.) Check out my favorite takes on the trend below. Crayola-colored links make such a strong impact in shiny resin. Double strands of tortoiseshell resin are offset by a neon yellow frog for a touch of whimsy. Hand-painted green twine combines with blush-colored herringbone ribbon in an adjustable silhouette that will certainly have all eyes on you. Ah, Marni. 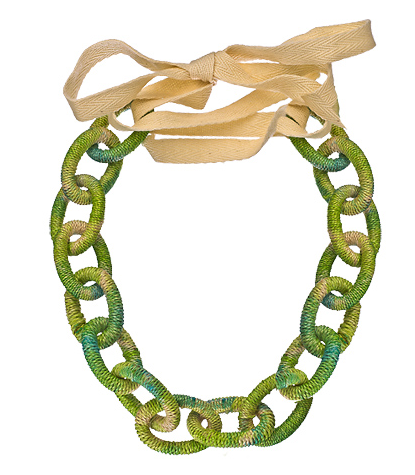 Tie the black cotton ribbon behind your neck and let the bright green links bring a little joy to your day. Hear the call of the wild with links of leopard print. i love these necklaces! i'm on the hunt for a cheap one!